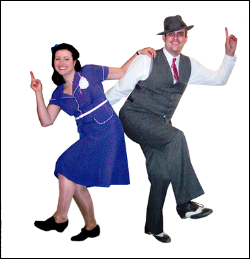 ﻿ Learn Lindy Hop, Jitterbug and Jive in Lincolnshire. Welcome to 52nd Street Jump. We teach Lindy Hop, the original jive dance, at our classes in Lincoln and Louth, Lincolnshire. Why not join us and learn this fantastic swing dance while enjoying music from the 30’s to the 50’s? Your fist steps can be mastered quickly and you’ll soon be enjoying the dance known by many in the 1940’s as Jitterbug. And that’s just the beginning: You can enjoy mastering all the steps and styling that Lindy Hop has to offer as well as learning other dances such as Balboa. We hope that you’ll find everything you need here on our website but, if you have any questions, feel free to drop us an email at info@52ndstreetjump.co.uk or give us a call on 01507 463130. We look forward to welcoming you onto the dance floor! Here is our calendar of events for the next few weeks. Click on the event name for more details. For more upcoming events, check out our calendar. Party night - one class & extended freestyle. Bring a little food to share. Balboa class and extended freestyle. classes are, make you one in a million. good connection in Lindy as well as in life, and we have you to thank for that.